You are here: Home / Fixed Income (Bank FDs,RDs,PF etc) / EPF Interest Income & Withdrawals | Tax Implications | Is EPF Interest taxable? Each and every investment you make has to go through three different stages i.e., i) Investment / Contribution stage, ii) Income Earning Stage & iii) Withdrawal or redemption stage. In each stage the investments/earnings can either be Taxed (T) or Exempted (E) from the taxes. Same is the case with your contributions to EPF (Employees Provident Fund) Scheme. The deductions towards EPF (Employee share) are eligible for tax deduction under section 80c. This is in the investment phase. Your PF Deposit earns ‘interest income’. This is tax-exempt (subject to certain conditions). When you withdraw your EPF balance, the withdrawal is tax-free (subject to certain conditions). So, it is a widely held belief that EPF falls under Exempt-Exempt-Exempt Category. Is this assumption totally true? Are EPF interest income and withdrawals tax-free, irrespective of when you withdraw the funds? What if you remain unemployed, do not contribute to EPF for few years and then withdraw it? What would be the tax implications on such PF withdrawals? Is interest payable even if you do not contribute to EPF scheme? – Let’s discuss…. Is EPF Interest income Taxable or Tax-free? How are EPF Withdrawals taxed? Below are the taxation rules applicable for EPF withdrawals & interest income earned on PF contributions, under different scenarios. If you withdraw your EPF balance before completing 5 years of continuous service, it is considered as a taxable income. However, members whose service has been terminated due to his ill health, contraction or discontinuance of business of employer or other cause beyond the control of the member, no income tax (TDS) shall be deducted as per Rule 8 of Fourth Schedule to the Income Tax Act, 1961. In addition to this, your employer’s contributions along with the accumulated interest amount will be taxed as ‘profits in lieu of salary’. If you withdraw the EPF balance after completing 5 yrs of service, then EPF balance is not taxable. So, in this case, it falls under E-E-E tax category. The interest income is considered as an Exempt income under Section 10(12) of the IT Act. If you resign/retire/get terminated from your job, but do not withdraw your EPF immediately then interest income earned on your EPF balance is taxable during this non-contributory period. The interest income earned during your employment remains tax-exempted though. For example : Let’s say you have joined a company and started contributing to EPF Scheme at the age of 25 years. After remaining employed till the age of 40 years, you decide to quit and start your own business venture. However, you decide not to withdraw your EPF immediately (as EPFO pays interest income even if one does not contribute to EPF). At the age of 55, you decide to withdraw EPF. In this scenario, what are the tax implications on the accumulated EPF interest income and withdrawal of PF balance? The interest income accumulated during your employment period (from 25 years of your age till 40 years) is tax-free income. The interest income earned during the non-contributory period (i.e., from 40 years till 55 years) is a taxable income (though your total service period is more than 5 years). The interest accrued in each financial year during the non-contributory period should be declared in your Income Tax Return under the head ‘income from other sources’ and taxes (if any) have to be paid. So, interest income is taxable in the year in which it is accrued (on yearly basis). Kindly note that the EPFO pays interest income on all EPF accounts till an EPF member attains the age of 58 years. But, the interest accrued from the year of unemployment (due to resignation/termination/retirement) till you actually withdraw your EPF is a taxable income. On the other hand, if an employee retires after 55 years of age, then post three years from the date of retirement (i.e., after 58 years), his/her EPF account is treated as “inoperative” and does not earn any interest. In case, you are contributing to a Recognized PF maintained by a Private Trust of your Company (Exempted Organisation), any interest exceeding 9.5% shall be added to your (employee’s) Salary Income and is subject to income tax. Hope you find this post informative and useful. In case, you have any query related to EPF account, kindly post it in the below ‘comment’ section. i have contacted Sree Sir in Linkedin regarding my PF account, My Employer was not approving my DOB Change. He has suggested me and solved my problem. Your the BEST OF ALL and Give the Positive thoughts, You have answer for everything. I have a work ex of 2 years and resigned one month ago to pursue my Masters abroad. I wish to withdraw the entire PF and Pension amount. I have linked my Aadhaar and bank details on EPFO portal but unable to link my PAN(verification problem). My PF(Employer+Employee) amount is approx 40k till date and 20k as Pension. If I file claim form after 60days of my unemployment separately for PF and Pension, will it attract tax? Yes, it is a taxable income. I was work in a company for 4 and half years and PF amount is 158000/- i have entered pan but not verified.How about the TDS deduction rate if 34+% can i claim the same? I have feed the PAN details it is showing in the portal but not verified. As your service period is less than 5 years, whether TDS gets deducted or not, such withdrawal is a taxable income. In case, they deduct 30% TDS and let’s say you are in 20% tax slab then you can claim the balance amount as Refund when you file your ITR. I have an EPF account which has been inoperative since May 2016. In April 2019 it will be 3 years since the last deposit to the account. Can you advise if the interest earned on the account from May 2016 to April 2019 is taxable or the interest after completion of 3 years is taxable. Interest earned during 2016-19 is a taxable income. Related article : Interest on Inoperative EPF accounts | Will I get interest on my Dormant EPF account? Hi, I left my job after 4 years of continuous Service and now started my own company. I don’t intend to Withdraw my PF balance until retirement age. Does my EPF balance becomes taxable income this year? Also what about the interest I earn on this balance? I think that would be taxable as normal interest income. Kindly let me know if my understanding is correct. Interest income earned till the date of your Exit is not taxable. Interest earned during non-contribution period is taxable in the respective Assessment years. I have completed 4 years of service. It is possible to partial withdrawal of EPF amount for purchasing Plot or Flat? and its taxable? and How much percentage of amount can i withdraw for the above purpose? Kindly note that EPF partial withdrawals are not taxable. Kindly go through this article : EPF partial withdrawal options and rules.. I have completed almost 4.5 years of total service in India and moved abroad for a new job 1 year ago. I want to withdraw my PF and Pension amount. Will it be considered Taxable income? Dear Rahul.. Yes, it is a taxable income. I switched to a new company and I didn’t transfer the EPF and will do the same soon and have no intention of withdrawing it. So, is the interest that I got till now from the old company is taxable? Dear Hemanth ..If there is no non-contributory period in between then the accumulated interest on your EPF account(s) is not taxable. Dear Mr. Sreekanth – I left my job in 2014 and have kept the EPF to earn interest. Is the entire interest on EPF post leaving the job taxable or the interest on the balance on date of leaving is exempt. What happens to the previous years prior to the new ruling? Is it taxable on accrual basis or on withdrawal only? Should we not take it up with Government to change this decision? Thanks. The interest on EPF balance post leaving the job taxable. Kindly note that it is not a new ruling. Ideally one has to show the taxable income on accrual basis in his/her ITR. Hi Srikanth, In this case does EPFO takes care of TDS on the interest income, or the assessee needs to pay the tax and refer it in his ITR? Also where one have to report this interest in ITR-1? Is it under head “Income under other sources” by clubbing it with bank interest or somewhere else? Hi Srikanth, I got the answer for my second question when I went thru QA section. Sorry, but I have one more question. Does interest earned on both Employee’s contribution as well as Employer’s contribution is taxable OR its just interest earned on Employee’s contribution? Thank you. Your employer’s contributions along with the accumulated interest amount will also be taxed as ‘profits in lieu of salary’. Thank you Srikanth, You mean to say I need to pay tax on employer’s contribution till date as well? Why? Sorry I got confused with your answer. Since I am no longer working for past 2 years, there is no contribution either from me or from ex-Employer. The only addition is in form of interest credited by EPFO on the Employee contribution and Employer’s contribution. My questions were specific (1) Do I need to pay tax on entire interest credited to my account OR only for interest credited for on the accumulated portion of Employer’s contribution. (2) Where do I show this interest on my ITR? Is it under head “Income under other sources” by clubbing it with bank interest or somewhere else? You had mentioned ‘profits in lieu of salary’. Note that I have NOT withdrawn any amount from my EPF account. So please clarify. Thank You. In case, you have not withdrawn any EPF amount then the entire interest paid on your EPF balance is taxable under the head ‘income from other sources’. That makes sense. Thank you Sreekanth. Also I appreciate you for responding to queries from all of us patiently, its great community service by you. Thank you dear Vai ..Keep visiting ReLakhs! Went through your beautiful and useful clarifications through this portal. Well, I have a doubt pertaining to charging IT on PF accrued interest kept with Provident Fund even after retirement. This issue of interest accrued is chargeable to IT has come to surface consequent to the ITAT Banglore’s decision. How can such a thing be applied retrospectively? Retirees should have been informed on the eve of retirement of such a provision so that they could have decided to continue or withdraw. Further, had it been indicated then, TDS or on filing Return, Tax could have been paid on that. Now expecting the person who withdraws to pay IT on the accumulated interest of previous years, is not ethical. No doubt, retirees keep the PF Balance with the Fund as an Investment decision only. Was there a further appeal in the ITAT Case of Bangalore? How the Grievances of those retirees who continue to park their balance with the PF can be alleviated? IT Department may kindly bring out an announcement, as a sort of gesture to such cases, by asking them to pay IT on the interest payable for the AY 2018-19 onwards. Will you be able to appreciate the points put forth and shed light on the same? Kindly note that this not a new Tax rule. The interpretation of an existing tax rule by most of us has been wrong.That’s it! Agreed Mr. Sreekanth that it is a matter of interpretation. Even then it should be prospective, and more importantly since we do receive the interest it should be payable on withdrawal only. I agree with Mr. Ravikumar that like PPF this interest must also be exempt till retirement i.e. 58 age, and we must all represent to the government about the same. Thanks. Agree with your views! But, unfortunately, that’s how the tax law has been framed w.r.t EPF withdrawals..
My continous service in India is less than 5 years. I have shifted to UK on a dependent visa. My wife got a job in UK and me and my 3 year old son got dependent visa. Will this be considered as cirumstances beyond control as per income tax rule 8 and can on that basis my PF withdrawal become non taxable. May not be considered as beyond control. But, you can withdraw EPF full balance after being unemployed for minimum 60 days (or if not contributing to EPF scheme). So there is nothing I can do to save tax on the same? In case, you do not have any other sources of Income (in India) or your total income is below basic exemption limit (Rs 2.5 Lakh) and in case EPFO deducts TDS then you can claim it as REFUND when you file your ITR. Read : TDS & Misconceptions. Dear Anthony .. It depends on the quantum of income. If the income for that FY is say below basic exemption limit and TDS has been deducted then one can claim Refund (if any) by filing ITR. Due to the recent itat decision taxing the interest portion if it is withdrawn post retirement, could you please tell me whether the interest is to be taxesd under the head IFOS or is tax to be continued to be deducted by employer on interest accumulated post retirement? Could you please tell me which section of the act / rules gives clarity on this issue. Section 10 (12) of the I-T Act. refers to Payment Received from Recognised Provident Fund. 1. Will the withdrawal amount be tax free? 2. Only the interest of the last (non-contributing) year will be taxable? How it will be treated? 1 & 2 – The contribution period is only considered ie 4 years. Withdrawal of funds will still be taxable. I am supposed to attain my retirement age of 60 with last day of working on 3rd Jan. I am covered under EPF. I findd that my salary for any month is paid at the beginning of the following month with EPF contribution shown in ‘Member Passbook’ sometime around 20th of that month. I also find that the interest in the Member Passbook is shown as ‘Interest till 31st March’ but generally appears sometimes in July. My last contribution for 3 days’ work in January will appear in the Passbook around 20th February. Now my question is 1) Do I need to apply for complete withdrawal 60 days’ after 20th February or 3rd January? 2) Shall I get the last installment of interest for the period April to the date of actual settlement or date of application or 20th February? 3) Or, is no interest for the above period is applicable since at the time of application, fund balance reflects no such interest for the above period and such entry is made only around July? 4) If I wait till say July, when such interest till 31st March is reflected and then apply for withdrawal, what is the tax implication. Kindly advise. 2, 3 & 4 – Yes, total accumulated interest is payable. Thanks Sreekanthji for your clarifications. I shall check with my employer for the information of updated date of exit. For more queries in this regard, I shall again bother you later. I have got one more question related to EPS. In my EPF passbook, the pension amount shown is just from my last employer, so how the EPS claim works ? Does the department bring and calculate all EPS from the date of contribution or they just give it what is shown in the passbook ? Did you work for multiple companies? Did you transfer funds from old EPF account(s) to the latest one? I have moved abroad in May 2017 (Contributed EPF and EPS for 8.2 years in India) and could not withdraw my PF before coming. I have two questions to clarify before I initiate the withdrawal. 1) Is the PF interest earned after May2017 is still taxable even if the income in India is below 2.5 lacs which is free tax slab. Heard from some friend that if the interest earned is less than 2.5 lacs, then it’s not taxable. 2) Can I withdraw my full EPF and EPS and are they not taxable ? 1 – No, it won’t be taxable in such a scenario. 2 – You can claim full balances, it is not a taxable income. However, if your PAN is not linked to UAN, online withdrawals can be charged with TDS. In this case, one can claim it as refund (if any) by filing ITR.. Thank you Sreekanth for your reply. Do you know how long it takes to credit the money in the account after the Claim is settle down by EPF department. I could see that, in the UAN portal, the current status showing as ‘Claim Settled’ for the last 4 days however the amount has not received yet. I just received money in my account but could see the deduction of around 7.85%. In my passbook the total amount is showing as X and I received X-8.5%. Do you know why ? Can you suggest me whom to contact for this ? If it is around 10% then we could have assumed it as TDS. Thanks Srekanth for your quick response. Yes it’s exact 10%, It was my miscalculation earlier. But do you know why have they deducted and whether will get that amont after registering the grievance ? Is your PAN linked and verified in your UAN interface? May I know your service period (num of years)? Yes Sreekanth, PAN is linked and verified in UAN portal. My service period is : Feb 2009 to April 2017(8 years 2 months). EPF withdrawals after 5 year service period are tax-exempt. Kindly check your Form 26AS for FY 2018-19 after few days, in case you find TDS deducted, you may claim it when you file your ITR for AY 2019-20. Okay, Sure Sreekanth. I have also filed grievance with EPF department as you suggested earlier. Have you seen any cases where EPF department themselves has rectified the issue upon filing the grievance ? Dear Sanjay ..I dont think they will rectify based on the grievance request..
Just wanted to share the final update from the EPF department regarding the Tax deduction, so the form 15G is not submitted and there is no way to submit it online, so don’t know if this is the loop hole in the system or ? Details of Final Reply :	10 percent TDS deducted as form-15G not submitted. Don’t know what should I do next? As suggested – Kindly check your Form 26AS for FY 2018-19 after few days, in case you find TDS deducted, you may claim it when you file your ITR for AY 2019-20. Yes, you can rectify/revise your ITR. Suggest you to kindly consult a CA. 1) Thanks a lot for your timely advice, and As per PF commissioner’s office beyond the age of 58 years also, as long as I am employed until this age of 61 years and stopped employment in Dec’17.. my PF account would be active for another 3 more years and the interest would be paid., and I understand to leave my PF with commissioners office ( without withdrawing) for few years whatever possible as outside bank FD interest is lesser. Also, they said if I go again for another employment now beyond 61 years and PF starts accumulating again. 2) And clarified only PENSION would not be there beyond 58years and hence employer also should not deduct beyond 58 years. Thank you for sharing this important information with us! So, the EPFO pays interest on the contributions made to the EPF a/c beyond member’s age of 58 as well?? But EPS contributions are not accepted. Is my understanding correct? After having a discussion with EPF office, what I understand is in Pvt companies you may work as long as you can even beyond 70 years of age also, and their PF would be accumulated but pension ( EPS) would not be there after 58 years. Also for 3 years after the last PF the last contribution, the account would be active and interest rate as per guidelines of the year ( Ex: present 2017-18 the interest rate is 8.55%). so maybe as senior citizens, max FD interest rate in Banks is 7.6 %, so may be advisable to retain in EPF office. Yes, your understanding is correct and thanks for the inputs! 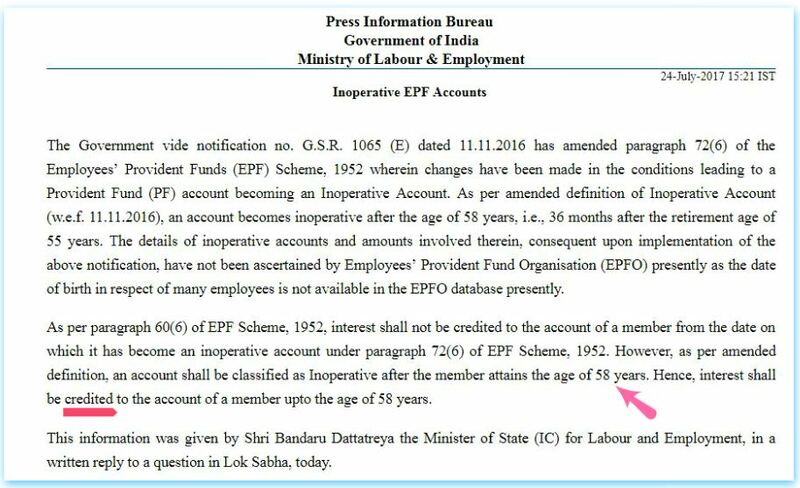 After 58 years of age, EPF can be continued but not EPS. That’s correct! Yes, it can be a painful process to get the transfer done between two EPF acs maintained by PVT Trusts. You need to follow it with respective employers only. As per the EPFO’s notification issued in last FY, all in-operative EPF accounts get interest payment from April 2016 onwards. I am working in IT with 30% taxable salary bracket. Now I am also in parallel working as a Marketing freelancer for US and taking work. My employer is deducting my 30% tax as per my salary. The question is how should I pay my taxes for the freelance work? Will that be 1- presumptive tax scheme 2- ITR 30% on my freelance income or 3. GST? Please help. Thank you. I believe that you may not be eligible to file tax return on Presumptive basis. If the PF withdrawal amount is more 2.5 lakhs and contribution period is less than 5 years , as form 15 G is not applicable what is the percentage of tax deductible ? Is it 5 % as it is the tax rate for income slab 2.5 to 5 lakh? If it is offline claim, the EPFO may generally ask for Form 15G (even if not eligible, not sure why they require it). I believe that they deduct 10% TDS. Kindly note that the entire withdrawal is subject to taxes and the actual tax rate depends on the individuals slab rate. OUR ONE EMPLOYEE NAME WAS REGISTER IN PF OFFICE IS MD SHAHNAWAZ MALLICK. BUT HE WAS DIED. HIS DEATH CERTIFICATE IS WRITTEN SHAHNAWAZ MOLLICK, AND HIS OTHER DOCUMENT WAS VOTER ID , DRIVING LICENCE WAS SHAHNAWAZ MOLLICK. HE WAS DIED ON 2013 APRIL. WHY WAY HIS NAME WILL CHANGE IN EPFO REGISTER. KINDLY REPLY AS SOON AS POSSIBLE. Sorry, I am not sure on this, kindly contact the EPFO. Thanks for such an informative blog and creating an awareness about the complicated EPF rules around withdrawals & TDS. I worked in Company X for 5.5 years contributing to an EPF account number AAA then the same company transferred me to Germany on an international assignment where I still kept contributing to EPF for another 2 years using a different EPF account BBB. Subsequently, I took a local contract in the Singapore branch of the same company with no more contribution to EPF since July 2015. 1. I am assuming that the 23 months accumulation can be withdrawn subject to 10% TDS as I have a PAN. Is that correct? 2. I submitted the claim for full PF withdrawal in August 2017 (no contribution has been in that EPF account BBB since July 2015) but it was rejected by the EPFO stating the reason that “withdrawal not allowed for foreign worker till retirement age 58 is attained”. Can you please let me know if it is a valid reason for rejection of my claim? If not, is there an option to raise a grievance and will it be successful? Why did the same company create second EPF account (BBB)? 1 – Yes. It is a taxable income as the service period is less than 5 years. 2 – In fact, a foreign worker can submit the full withdrawal claim immediately before leaving abroad. Not sure whey did they reject based on the mentioned reason.. You may try withdrawing the funds again now. How to submit online PF claim? How to withdraw PF through govt UMANG app? Thanks a lot for the prompt response. So, I will assume they should deduct 10% as TDS and pay the remaining amount. Correct? The reason for second EPF account was that it was 2 separate legal entities within the same parent company. I have filed a grievance to the EPFO and hope they can give a reason why I can’t withdraw the full amount before the age 58. Let’s see what they come back with now. 1 – TDS can be 10% but as it is a taxable income, the applicable tax rate is as per your tax slab (it has to be disclosed in your ITR). Thank you for useful blogs. I have few queries in this regard that you will hopefully be able to clarify. 1. The member passbook downloaded from EPFO website has entries corresponding to transfer of PF for initial 2 years of service, as well as the subsequent 4 years of service. However, when I login to EPFO unified portal, the ‘service history’ only shows the latest 4 years of service (initial 2 years of service is missing). If I place a request to withdraw EPF now, does EPFO consider only 4 years of service and hence the withdrawal will be subjected to TDS, considering it as less than 5 years service? 2. I have recently come to know about ‘one employee – one EPF account’ to consolidate past PF accounts and placed a request online with EPFO, assuming that my initial 2 years of service also will be added to ‘service history’ in unified portal (a) Is that understanding correct? (b) Does this mean EPFO will consider my total service as 6 years after this request is actioned by them, hence EPF withdrawal after that will not be subjected to TDS (though I was not contributing to EPF for 3 years in between)? 3. The employee share of EPF that I am eligible to withdraw is about 5 lakh rupees. Is it considered as other sources of income and subjected to income tax also (irrespective of TDS is applicable or not), based on the tax bracket for the respective financial year? 4. Understand from your blog that the interest income accrued during non-contributory period is taxable. I guess no TDS will be applicable for this interest, but only income tax. If so, what is the percentage of income tax – Is it added to other sources of income and will be subjected to applicable tax, based on tax bracket for the respective financial year? 1 – If the transfer has been successfully completed, the service period of 6 years will be considered. In such a case, tax is not applicable. You can submit online grievance request and check your total service period. 2 – Did you submit transfer request earlier? from EPF 1 to EPF 2?? If not, you can use one EPF facility. Yes, your understanding is correct. 3 – If service period is more than 5 years, the entire EPF balance withdrawal is tax-free. 4 – TDS is part of Income tax. Kindly read : TDS & misconceptions! Dear Sreekanth – thank you for the clarifications provided. I have submitted my transfer request from EPF 1 to EPF 2 couple of days back only, so I guessthis will take atleast couple of weeks for processing. I have also submitted online grievance request now with EPFO to check service period and accordingly will take it forward. Dear Sreekanth..It takes 2 to 5 business days to get the credit (from the date of claim settlement). Meanwhile, kindly cross check your bank account details given in the claim form/linked to UAN. 2. If I have just worked for 7 years, I won’t be eligible for Pension and so can I withdraw my EPS as well? Is there a separate form for this or will EPFO return that to me on their own? 3. if I withdraw my EPF and EPS contributions and start getting a salary again in future where I start my EPF contributions again, the cycle of years of service will start again but will my UAN, EPF number etc change? 1 – If one is unemployed/self-employed and has a long investment time-frame, can surely consider better investment alternatives for wealth accumulation. 2 – If you are not employed and currently not contributing to EPF scheme, can withdraw full EPF and EPS. You can submit withdrawal claim online or offline. 3 – Yes, cycle for calculating of service period will restart. Your UAN remains the same. You can submit the same UAN to your next employer, they will issue new EPF ac (Member-ID) which will be linked to your existing UAN. Thanks a lot for the quick reply! Really Appreciated!! Thanks for informative article as usual. If one retires at the age of 60 years or more, will the contribution be recognised for 80C beyond the age of 60 years, will interest earned on contribution also continue to be tax free or contribution and interest earned up to 58 years only will be recognised and tax free? If one is retiring and not employed, then how is it possible to contribute to EPF? I believe if one is employed even beyond 58 years and contribute to EPF scheme, his/her contributions are eligible for tax deduction and regular interest is payable, which should be tax-free. My last contribution to my epf account is October,2016. Shall I continue my account upto age of 58 years. Now my age is 52 years. Shall I get interest upto age of my 58 years. How much percentage of interest is taxable if no contributions to my epf account? Am I eligible for pension ? Please give reply. EPFO will pay interest on your accumulate PF balance till 58 years. However, the interest credited between Oct 2016 till the age you attain 58 years, is taxable as per the applicable income tax slab. If you have contributed to EPF for more than 10 years then pension is applicable to you. If you submit investment declaration/Proofs to your employer then they can calculate your projected tax liability and deduct TDS. They will then issue Form-16. You can prepare your ITR based on this and calculate actual tax liability (nil tax/refund/tax dues). In case, you do not have proofs or not have made investments as of now for tax saving or your employer is not accepting the proofs then you can claim tax deductions (if any) while filing your ITR and claim refund (if any).